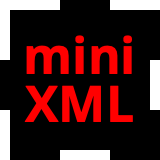 Mini-XML is a tiny XML library that you can use to read and write XML and XML-like data files in your application without requiring large non-standard libraries. Mini-XML only requires an ANSI C compatible compiler (GCC works, as do most vendors’ ANSI C compilers) and a make program. Supports integer, real, opaque (“cdata”), and text data types in “leaf” nodes. “Find” and “walk” functions for easily locating and navigating trees of data. Mini-XML doesn’t do validation or other types of processing on the data based upon schema files or other sources of definition information. Note: Version 3.0 hides the definition of the mxml_node_t structure, requiring the use of the various accessor functions that were introduced in version 2.0. The Mini-XML library is licensed under the Apache License Version 2.0 with an exception to allow linking against GPL2/LGPL2-only software. See the files “LICENSE” and “NOTICE” for more information.